Rhythms Magazine is an Australian glossy bi-monthly print and digital publication dedicated to real music – vintage and contemporary: blues & roots, Americana, jazz, folk, country and world music. Circulation is currently at 100,000 per annum distributed nationally in newsagents and to subscribers, print and digitally. We publish 6 issues: January/February, March/April, May/June, July/August, September/October, November/December. 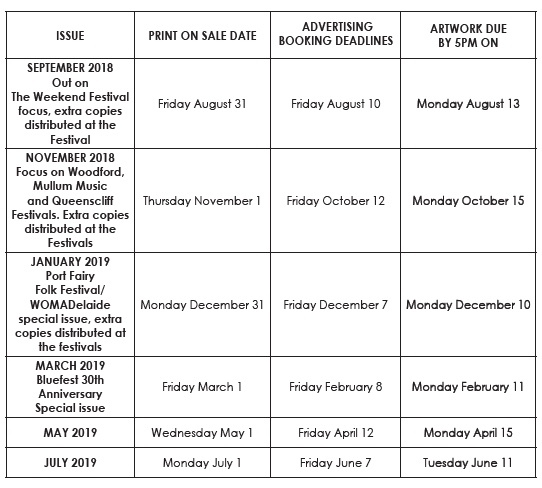 Rhythms offers 4 advertising opportunities. Please email: admin@rhythms.com.au for a Media Kit. Please email bookings@rhythms.com.au to book, negotiate packages and confirm specific deadline dates and bookings. – see below for a timeline guide. Please send all finished artwork with an HTML link to your desired destination to art@rhythms.com.au by 5pm Monday (date will be confirmed upon booking).